Lizzie is an only child who is about to join her stepfather’s sprawling family at the beach. As she, her mother, and stepfather make their way to Old Silver Beach in Massachusetts, Lizzie is equal parts anxious and eager to meet Isobel and Elyse. Together, the girls become the Triplins, cousins born in the same month of the same year. From that summer on, Lizzie, Isobel, and Elyse are as close as triplets. Three Story House is told by each of the Triplins, beginning with Lizzie. She is recovering from knee surgery with Isobel’s help. Lizzie and her parents are partially estranged, but the threat of condemnation hanging over Lizzie’s grandmother’s house is enough to convince her to return to Memphis for the first time in years. Reunited by a massive renovation project, the Triplins face their pasts and their futures together. Of the three, Elyse is the one who captured my interest the most – and the one I wish author Courtney Miller Santo wrote more about. What I liked the most was the relationship between the three. Lizzie, Isobel, and Elyse share something closer than sisters with a bond that is stronger than friendship. Time and share circumstance cemented the relationship that has lasted through childhood and adolescence, young adulthood, fame, travel, and even fragmented relationships with parents and siblings. 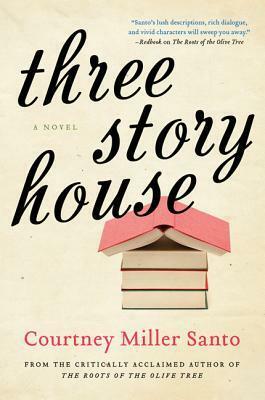 There’s a depth and warmth in every page of Three Story House. Unfortunately, the novel left me with unresolved feelings. Like Spite House, which feels like a character itself, I feel like there is more to see, more to be said. The ending seemed to come far too soon and to leave too much unfinished. But, then again, perhaps the ending is the perfect imitation of life. There is always uncertainty in tomorrow. What I have no doubt of, is that the Triplens of Three Story House will face it together.